We had a fun-filled day at the race track! 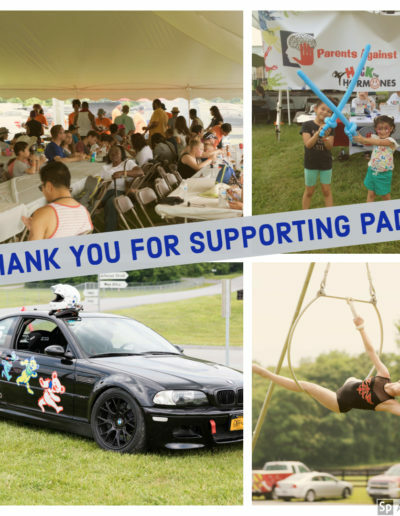 While pro racers compete during the day, enjoy fresh off the grill BBQ, carnival type activities for kids, local entertainment, and a showcase of race cars from all around the Mid-Atlantic. Ticket prices included access to entertainment, BBQ, and drinks. Ride-alongs with pro racers were available for an additional cost. Sponsored by TISTA Science and Technology and National Auto Sport Association (NASA), this event’s proceeds contributed to Parents Against Depression’s (PAD) mission to reduce the number of preventable suicides among youth 13 to 30 by increasing awareness, identifying gaps in diagnosis and treatment, and advocating for long-term policy change related to depression. NASA Mid Atlantic is the premier sports car racing and high performance driving organization in the Mid-Atlantic region. Their goal is to provide a variety of legal, organized, safety-minded road-racing and education-based high performance driving experiences for as many sports car enthusiasts as possible. Summit Point Motorsports Park features three road racing circuits that are used for amateur automobile, kart, motorcycle racing, high performance driver education and emergency training for local and federal law enforcement. Learn more at summitpoint-raceway.com/ .